The intertidal or literal zone is the area that is above water at low tide and under water at high tide. Normally it is divided in three subzones: the high, middle and low tide zones. At low tides a walk along a rocky coastline and inspection of the small creatures hiding in crevices and tidal pools can be great fun and a rewarding activity for children as well as adults. On sandy beaches, shell collecting has become a major attraction on Sunday outings. I still keep a vivid memory of that Sunday morning when my friends and I (then about 10 years old) found a couple of horseshoe crabs, stranded on a beach in Singapore. That early experience could very well have laid the foundation of my later passion for the world under the waterline. The intertidal zone also offers new challenges for UW photographers. Natural light will normally be abundant, which means that you probably do not need the strobes, perhaps only a small but powerful LED torch. A snorkel, mask and a compact housing with a 4/3 camera with fish-eye inside is a good starting point. Or even a Gopro on a pole for the narrow crevices The capricious patterns of colour and light, and the meandering reflections of objects under, as well as above the waterline on the the water surface, will often add a creative flavour to your pictures. At low tide sandy beaches with their tidal pools and ripple marks offer splendid images for wide angle top-side shooting. The intertidal zones of the world can take many different forms depending on its geographical location. At rocky coastlines, constantly exposed to strong winds and big waves the zone can be splashy and wild. Here, the tidal pools provide an ideal habitat for small fish, shrimps, krill, sea urchins and zooplankton. Seaweed and other plants have often attached themselves to rocks to avoid being washed away by the movement of the water. By living on the shoreline, seaweeds benefit from the light that would be blocked out by deeper waters. Smaller animals may avoid predators and competition for food by occupying a position higher up the shore. In the tidal pools of the rocky Mediterranean coast one will often find various green and yellow algae and anemones of the order of Actianaria. Most common are A. equina (beadlet anemone) and A. sulcata that expand their tentacles under the water level. Above the waterline, A. equina transforms into a blob of red jelly. Quite different are the intertidal zones of the mangrove swamps of tropical seas. At the most seaward edge one will find red mangroves, followed by black and white mangroves. Their tangle of roots allow the trees to handle the daily rise and fall of tides, which means that most mangroves get flooded at least twice per day. The roots also slow the movement of tidal waters, causing sediments to settle out of the water and build up the muddy bottom. The roots are well adapted to the high salinity of the water, by filtering out much of the salt out of the seawater. Mangrove oysters often attach themselves to the prop roots (Rhizophora) of the red mangrove. Intertidal temperature range can be extreme, varying from very hot during the day to cold during the nights. In addition, the salinity of water in the intertidal zone is much higher that in the open sea, because salt water trapped in rock pools evaporates leaving behind salt deposits. These two factors make these zones a harsh environment to survive. The smaller fish, however often seek refuge in the tidal pools where they are protected from large predators. In the mangrove forests of the Bahamas the lower tidal zones often provide a safe haven for baby lemon sharks to grow up. 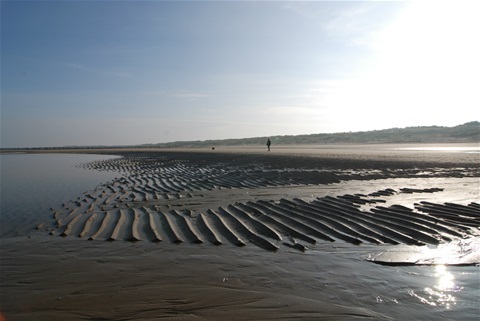 The large sandy beaches of Northern Europe are famous for their variety of bivalves lying in the sand at low tide. Bivalves are soft-bodied animals that are protected by two hard shells, hinged together. Scallops, ensis ensis, oysters and clams are often huddled or clustered in heaps by the waves, most of them empty. Certain beaches in Zeeland, a southern province of Holland, have become famous for its fossile shark teeth.